The aerial yoga hammock is a very versatile prop and it can be a lot of fun to explore creative ways to incorporate it into our yoga practice. 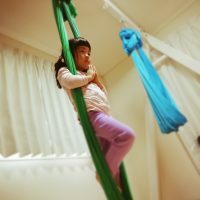 The aerial yoga hammock that we use in Unnata® Aerial Yoga is often the same apparatus as the aerial sling aerialists use for aerial acrobatics and circus acts. They are both equally awesome and equally challenging, but they are not one in the same. Even though the aerial yoga hammock and the circus sling share some obvious and important similarities the two approaches of aerial yoga and aerial circus actually have very little in common! Let me explain, in aerial yoga we are using the hammock to assist in our yoga practice. Yoga is a grounding practice (even when we’re elevated) that requires no special equipment, although props like the hammock can be incredibly useful. So in aerial yoga, we’re often using the ground and sharing weight with the hammock and that informs the choices we make about how to grip, how to engage or relax, how to sequence, and more. In aerial acrobatics it’s the complete opposite. We are training to be up in the air, flipping and rolling with nothing but the apparatus to keep us there. This means we support ourselves very differently for aerial acrobatics. We also have very different motivations for the decisions we make as we move from skill to skill. Everyone in the air needs to make safety the first priority (that’s one of the similarities I was talking about), but acrobats are motivated to entertain and thrill, while yogis are motivated to an inner practice. These differences are where things can get murky for someone wanting to explore further on possibilities with the apparatus. Check out the two photos here to challenge your eye. Each photo shows a standard skill that might be taught in a beginner class for each respective discipline. These skills look similar but they are actually very different. How many differences can you spot? Do you know which version might lead to acrobatic skills and which would not? Can you see why? Leave a comment below and let us know what differences and similarities you see between the two photos, and what those differences and similarities might mean. What do you do if you’re an aerial yoga instructor and you are looking for more poses to teach or your students are interested in aerial acrobatic skills they may have seen on social media? 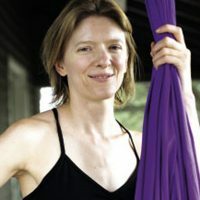 In our Unnata® Teacher Training Course we address these concerns by diving deep into the technique of using the hammock for yoga, teaching the purpose of everything we do with the hammock, the motivations behind the poses we choose and empowering teachers with sequencing knowledge. 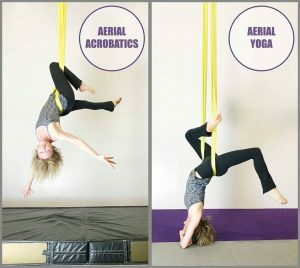 Here are just a few reasons to think very carefully if you are tempted to put aerial acrobatics skills in your aerial yoga class. Acrobatic skills have progressions that are taught in aerial acrobatics classes, with hands-on spotting, conditioning drills, low student/teacher ratio, prerequisite skills, and of course, crash mats so students can safely learn these skills. Many acrobatic skills require more height away from the ground, so a stray limb doesn’t hit the ground, and the head never risks hitting the ground. The extra height and the added dynamics make a rated safety mat a necessity. Aerial Yoga is a yoga practice (that’s why it’s Aerial Yoga, and not Aerial Acrobatics!). If you take the yoga out of it you are left with Aerial. Keep these questions in mind when considering adding new poses to the yoga class. How does this skill enhance the yoga experience for my students? 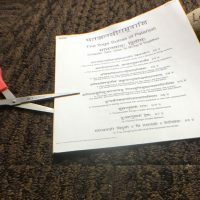 (An aerialist’s forward dive has no more value in an aerial yoga class than a gymnast’s back flip in a ground yoga class.) What risk does this create for my students? Do I have thick crash mats rated for aerial acrobatics under the student? Is my rigging capable of supporting this dynamic movement? Are my hammocks an appropriate distance off of the floor to minimize risk? How slowly can you pull up from seated to standing using the hammock? How many slow breaths can you take to get there? How slowly can you lift your feet off the floor when going into a back straddle? How slowly can you put them back down? Can you make a simple vinyasa out of this? How deeply can you curl your spine in each direction in an aerial (or grounded) cat/cow? In aerial yoga we turn and move in all directions, not just left right up and down but all of the places in between. Spend some time exploring vinyasas that you can flow with to challenge your students’ sense of space. How far can you shift off the plumb line without losing control? How smoothly can you shift from ground support to apparatus support? How smoothly can you shift from apparatus support to ground support? How efficiently and slowly can you move from upright to upside down and vice versa? How can different pranayama or visualization exercises be used in different poses? What does lifting energy through your chakras feel like when you are hanging upside down? Can you practice ahimsa, or incorporate Yoga Sutra 1.2, into how you practice each posture? Incorporate a theme, just like you would in a yoga class without the hammock. Challenge yourself to study a particular yoga posture and how you might use the hammock to help assist that posture. Ask yourself: What is a key component of this posture, and how can the hammock help with that? Where does the hammock press on the body, and where does gravity pull on the body? How does this complement or contrast what happens in the floor version? These explorations are something that we spend a lot​ of time on in the Unnata® Teacher Training course. The course is designed for trainees to understand how we use the hammock to enhance yoga, so that understanding can be further explored and developed beyond the course. I am often reminding my students that both aerialists and yogis strive to move with complete body control and understanding. So practicing an aerial skill without that awareness is neither yoga, nor is it aerial! At my aerial studio, when our aerial acrobats come to aerial yoga classes, they experience a completely different way of using the hammock. When our students want acrobatic skills, we send them to an aerial class with a qualified aerial instructor. When they want yoga, we send them to an aerial yoga class with a qualified aerial yoga instructor. Although they may use the same apparatus, the two approaches are actually very different in many important ways. Jordan is a firm believer that the practice of yoga (all 8 limbs of it!) can enhance anyone’s quality of life.